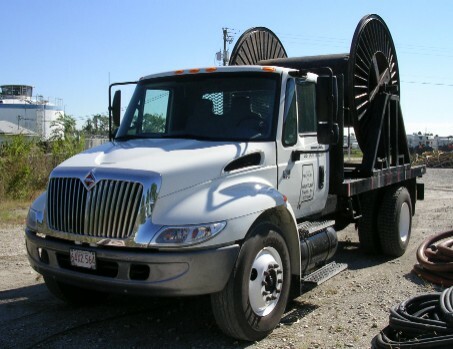 Cable Transportation – Hartline Supply Inc.
(1) On our spool trucks. (2) Palletized and hauled on our flat bed trucks. 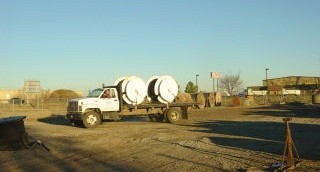 (3) Put on wooden or metal reels and hauled on our flat bed trucks. Our trucks pick up and deliver cables to customers in local areas surrounding each of the three shops. Customers located further distances usually ship their cables to us for repairs. We make the repairs and ship their cable back to be put into service. 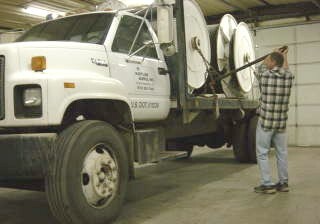 A Hartline Supply employee chaining down and securing the customer’s metal spools of cable to our flat bed truck. Customer’s metal spools of cable are loaded on one of Hartline Supply’s flat bed trucks and ready for delivery to the mine. The customer’s cable has been palletized on a large custom made pallet. We put the cable on the pallet in a figure-8 configuration per the customer’s specifications and requirements and bags are put over the coupler terminations for weather protection. The pallet of cable is taken to the mine for installation. 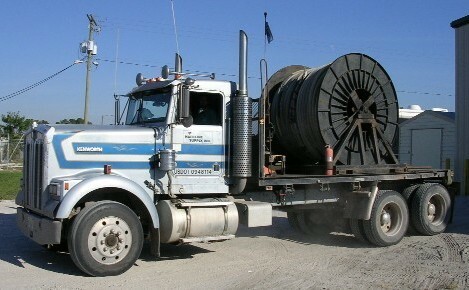 This is one of our spool trucks. 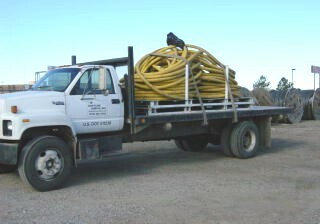 It is loaded with cable that has been picked up at a surface mine and brought back to our shop to be repaired.